The Angie Ortiz Community Service Award is presented to three students. 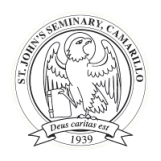 At the close of the spring semester, the Director of Students solicits nominations from the St. John’s Seminary Community at large. He subsequently selects three winners based on his review of the nominations. The awards are presented by the Director of Students at breakfast on last day of the academic calendar. Angie Ortiz was employed at St. John’s Seminary College and St. John’s Seminary from 1961-2002. She began her years of employment on the housekeeping staff and then eventually joined the kitchen crew. The mother of 5 and care-giver to a developmentally disabled brother-in-law, Angie embraced her days in the seminary community with joy and enthusiasm. Especially during the years when the seminary program was more restrictive, Angie became the surrogate mother to many seminarians. Her maternal care, home-made salsa and tortillas were welcomed offerings. For over 40 years, she exemplified dedication, commitment, and generosity toward all in the seminary community. After her retirement in 2002, this award was begun as a legacy to honor her and to all our staff who serve the seminary. The award acknowledges those in the community of seminarians who demonstrate outstanding service to the community by their dedication and generosity. Maria Angelina Ortiz entered her heavenly reward on January 3, 2006.